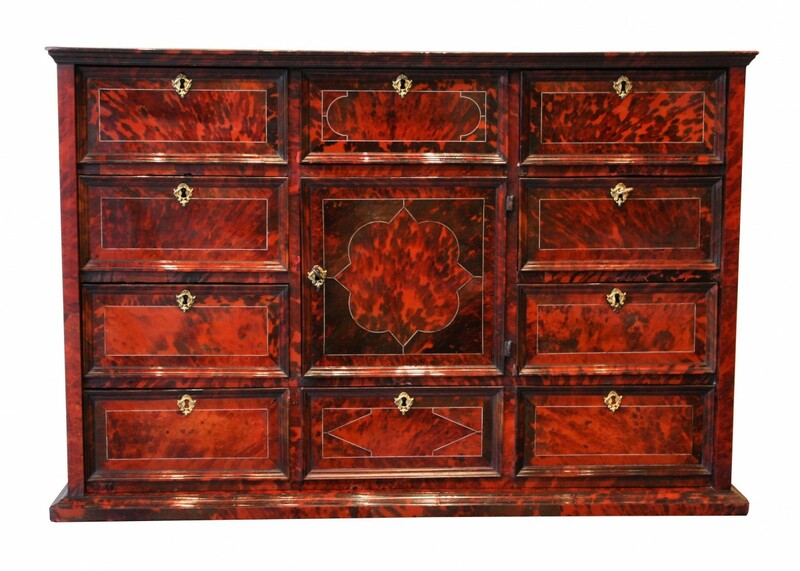 This rare cabinet is completely covered with plates of turtle shell tinted red so that we do not see the appearance of the wood. 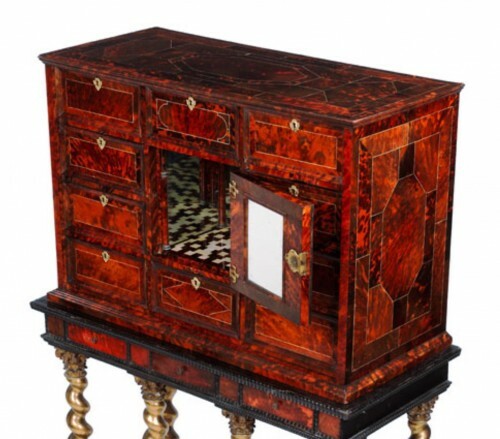 This extreme refinement is undoubtedly due to its sponsor who ordered its manufacture only with this expensive material. 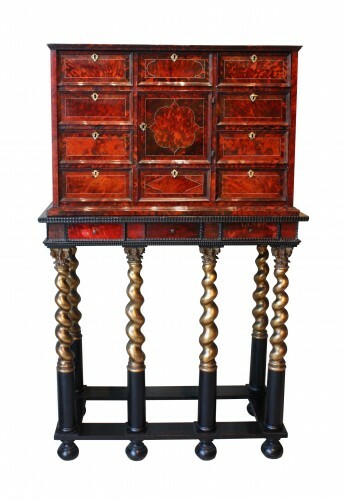 The scale in the seventeenth century arrived in Antwerp aboard ships from Southeast Asia and had met with great success among specialized cabinetmakers who used veneer to adorn the mirrors, cabinets and cabinets. 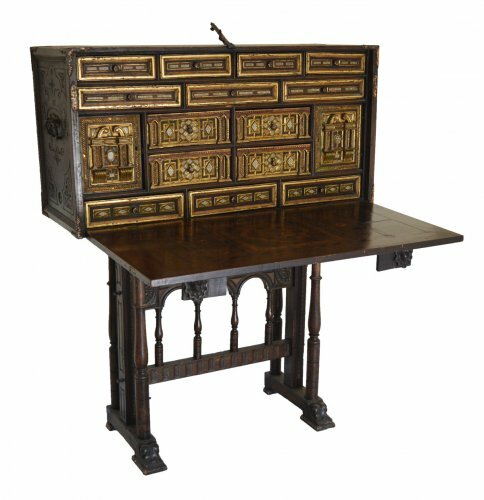 The cost being exorbitant, customers could only afford to decorate the cabinet drawers with cut-out plates, leaving the sides and top (less visible in an interior) of wood or veneer to reduce the cost of the work. In the case of our firm, the sponsor wanted to achieve a supreme luxury and afford a cabinet completely covered with scales (extremely rare for the top and sides). Another sign of high quality of our furniture is the drawer fronts usually oak on this kind of cabinet, here we are in the presence of drawer interiors in solid rosewood, imported exotic wood and very expensive in the seventeenth century. 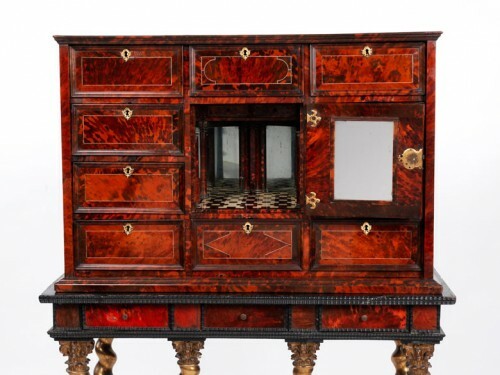 The use of rare and expensive materials on our cabinet demonstrates the richness and taste of its first owner who has not hesitated to acquire for his home a work of superior quality to distinguish himself from those around him. The commercial and port activity of the city of Antwerp was at the origin of many fortunes, it was essential for rich traders to have an interior that went hand in hand with their social status, the most refined works were sought so to contribute to the splendor and splendor of this city and its inhabitants in full economic and cultural effervescence. 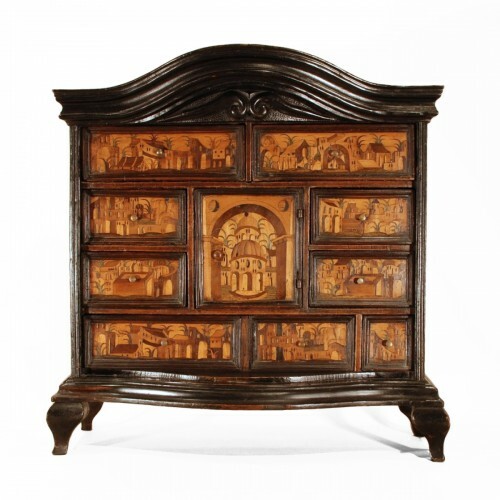 Our cabinet opens with seven small and one large drawers and a central door. Each drawer is clad in turtle shell front underlaid ivory nets inlaid with tortoiseshell moldings. 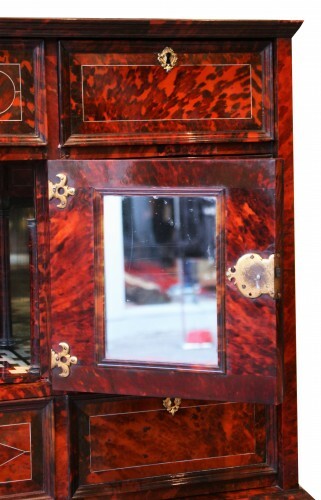 The central door has on its reverse a mirror in a frame of turtle veneer, and reveals a theater composed of alternating mirrors and tortoiseshell veneers and two small drawers above allow additional storage. 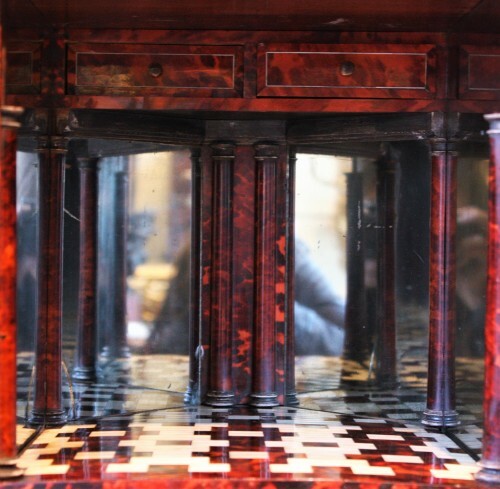 The floor is encrusted with tortoise and ivory arranged to form a geometric decoration. The top and sides are in tortoiseshell underlined with ivory nets. 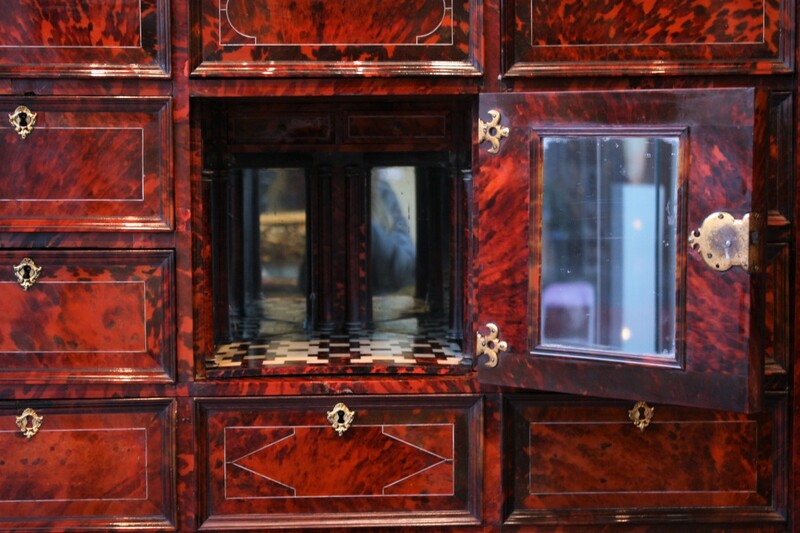 The lock entries discreetly adorn the drawers so as not to encroach on the tortoiseshell. 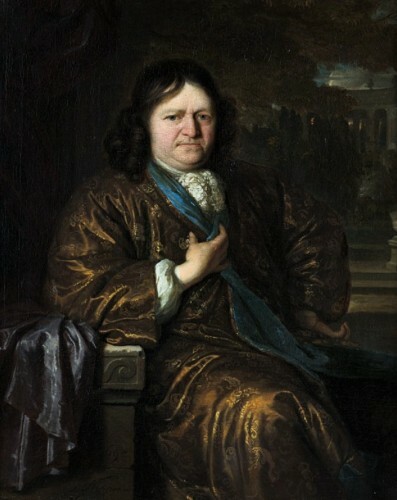 Antwerp work from the middle of the 17th century. 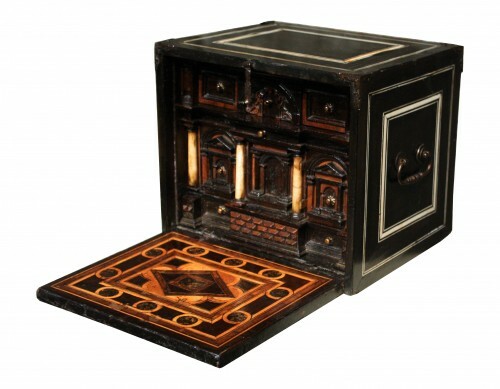 Small / medium sized cabinets were often originally designed without stand, and most often used carpeted tables / consoles. The base for our cabinet was manufactured in the nineteenth century. 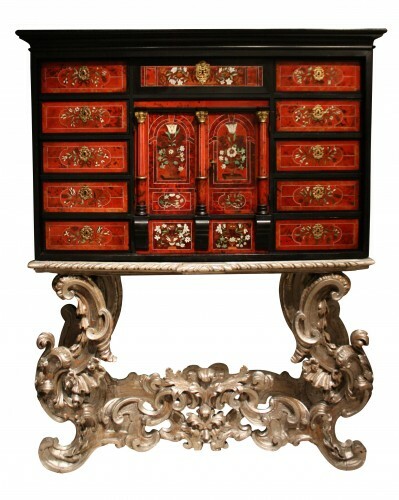 It is composed of a belt with drawers in tortoiseshell veneer supported by a set of 6 gilded and twisted wooden columns ending in blackened wood barrels. All brought together by a blackened wooden spacer and placed on balls feet. 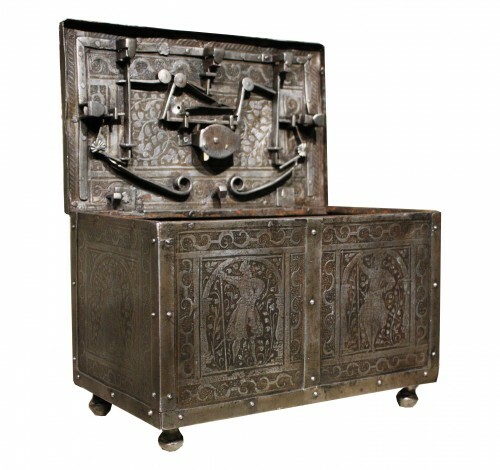 To be compared with the cabinet exhibited at the Rijksmuseum, Amsterdam, circa 1650, Antwerp. (Inventory no . : BK-NM-5669).